Bold lips are something I'm always experimenting with. I'm never quite sure if I pull them off or not, mostly because I don't feel like my eyes are dramatic enough for the effect. You know what I mean? I probably way overthink it, huh? 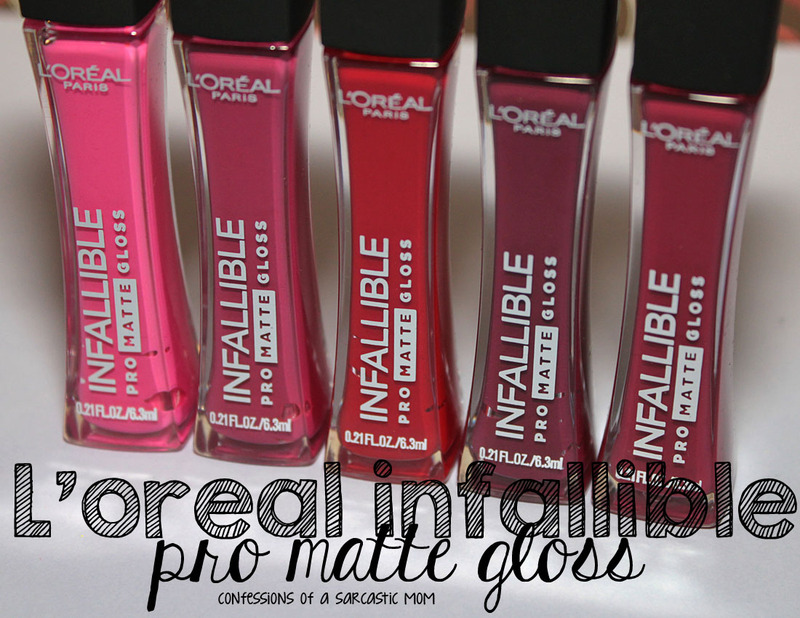 These L'Oreal Infallible Pro Matte Glosses are just the right amount of "ooomph" and "ahhh." They have pretty good wear time (4-5 hours with minimal touch-ups), are bright and fun to wear. The one thing I really like about these is the pigmentation. There's no denying just how intense these shades are! 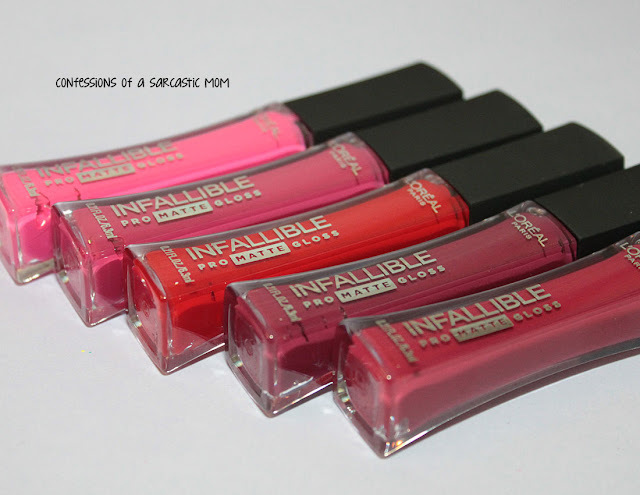 The texture is kind of velvety, and it's not drying on the lips by any means. Another thing is they are buildable. They are completely fine with one full swipe, honestly, but if you do some thin wispy swipes, you can build up the shades to be even more intense and bright! Fuchsia Amnesia turns very bubblegum-y on me, and while it may not be my favorite, it could be a favorite of someone out there! It's very bright, and has that "wow factor" that will make it a favorite with pink lovers. Shanghai Scarlet is a true red, a very vibrant shade of scarlet that is sure to appease those who reach for their red lipstick on the daily. There's just enough shine to this vinyl-y formula to give it that lucious appeal. Forbidden Kiss is a little too deep of a shade for me, I think. It went a little wild on me in the corner of my mouth, I can see haha! It leans to the blue end of the spectrum of purples, and it takes on a very vampy feel. Rouge Envy is my other favorite of this bunch - a very rosy pink! It leans red on the spectrum of purples, and that gives it that dusty rose look, And if I do say so myself, I look good in this shade haha! These glosses are priced between $7.99 and $9.99 (depending on the retailer), and I think they are definitely worth it. You can pick them up from the L'Oreal website, or various retailers, including Ulta, WalMart and Target. I mentioned my favorites were Rebel Rose and Rouge Envy - do you see one you like? Be on the lookout in a few days, after I've posted all my L'Oreal goodies - I could have some full-face looks show up here!